If you’re in the Seattle area and you happen to have a copy of the Sunday Seattle Times on your table, you might want to flip to page 14 of Pacific Northwest Magazine, where I have an article rhapsodizing about the pleasure (and ease) of homemade ricotta. If you’re not in the Seattle area and you’d like to know what I have to say on the topic, you’re in luck – it’s online too. Good article and an enjoyable read. I like the thread of gentle humor through it. I did see it and set it aside to save. Good to know it’s online as well. Thanks! Thank you for the lovely article. I might have to try this with our local (Whatcom County) raw Jersey milk. I suppose I’d scald the milk and then proceed? The Jersey milk has a wonderful flavor, and comes with it’s own cream! I can’t wait to give this a try. I wonder about serving it with some berries later this summer. Ann – I’m sure it will be incredible with raw milk. I can’t really give any advice on working with it, though scalding sounds like a good idea – perhaps scald, then add the buttermilk and bring back up to curdling temperature? And yes, with berries it will be divine! I was just in Seattle a few weeks ago and am totally jealous of all of the wonderful, fresh produce, seafood and dairy products available there! 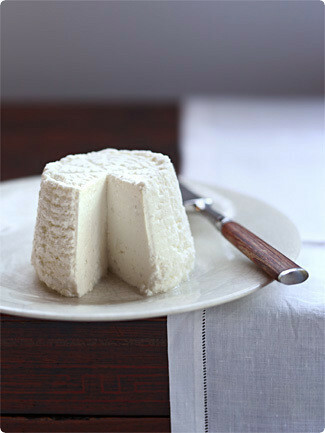 I adore homemade ricotta I agree that. it is nothing like the storebought stuff. Thanks for the great recipe. It is a little different from mine and I like it better! I am so jealous. This looks fantastic. Such a simple, beautiful photo too. Have you tried making this with milk from Jersey cows? Just wondering if the richness of the milk from em would have any difference on the ricotta.Lovely article in the Times BTW. I think making my own would improve the chances of success making "Italian Skillet Cheesecake" from Richard Sax’s CLASSIC HOME DESSERTS. I tried using cottage cheese – the turning-out-onto-a-wire-rack just didn’t work and using a commercial ricotta (when I looked at the ingredients it had "stabilizers") wasn’t good either. I think this recipe would be wonderful – each had promises of tasting good but I’d like to achieve the real thing. I cut out the recipe, too – we live in Woodinville outside of Seattle. Delicious! I found raw milk in our local Naturalia store and was looking for an occasion to buy it . I am also keen to try making confiture du lait using raw milk so now I have 2 reasons get amongst it ! I do live in the Seattle area and was so happy for you! Congratulations! Always a good read. Congratulations on the article. Congrats! Such an entertaining read…I’m about ready to make it myself! Thank you so much for sharing the article…should try it! I am so jealous. This looks fantastic. Such a simple, beautiful photo too. Have you tried making this with milk from Jersey cows? Just wondering if the richness of the milk from em would have any difference on the ricotta. Yum Melissa. That makes me want to try my hand at it. Lovely post! I’m glad you like PEI, it is one of my favourite places to visit as well; although living in central Canada I don’t get there all that often. Michael Smith is a culinary icon here, for better or worse, I’m not sure which. I laughed out loud when I saw his picture on your blog. Many thanks for all the excellent writing. I’ve been following you for well over a year and have derived a ton of enjoyment out of your postings. I love your blog! I’m lactose intolerant so usually I get grumpy and pass up posts like this. But just yesterday I made my own, lactose free ricotta. Using lactose free whole milk. It turned out amazing! Fresh cheese and home made ravioli stuffed with pumpkin. I had a religious experience. my first real cheese in 10 years.